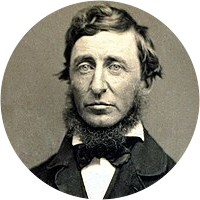 A collection of the best Henry David Thoreau quotations. We are all sculptors and painters, and our material is our own flesh and blood and bones. Any nobleness begins at once to refine a man's features, and meanness or sensuality to imbrute them. The hero obeys his own law. Write while the heat is in you. Keep your accounts on your thumbnail. Time is but the stream I go fishing in. Be it life or death, we seek only reality. The blue-bird carries the sky on his back. We hate the kindness which we don't understand. Every man is a builder of a temple called his body. As if you could kill time without injuring eternity! Wherever men have lived there is a story to be told. Morning is when I am awake and there is a dawn in me. Not till we are lost ... do we begin to find ourselves. For what are the classics but the noblest thoughts of man? There is never an instant's truce between virtue and vice. Each man can interpret another's experience only by his own. I think that we may safely trust a good deal more than we do. Our life is frittered away by detail . . . Simplify, simplify. We begin to praise when we begin to see a thing needs our assistance. We cannot well do without our sins; they are the highways of our virtue. Our molting season, like that of the fowls, must be a crisis in our lives. Let us not underrate the value of a fact; it will one day flower in a truth. While men believe in the infinite, some ponds will be thought to be bottomless. I love best to have each thing in its season, doing without it at all other times. The movements of the eyes express the perpetual and unconscious courtesy of the parties. The pleasures of the intellect are permanent, the pleasures of the heart are transitory. There has been no man of pure genius; as there has been none wholly destitute of genius. It would be glorious to see man at leisure for once. It is nothing but work, work, work. The author's character is read from title-page to end. Of this he never corrects the proofs. There is a chasm between knowledge and ignorance which the arches of science can never span. I am sorry to think that you do not get a man's most effective criticism until you provoke him. Society affects to estimate men by their talents, but really feels and knows them by their character. Superfluous wealth can buy superfluities only. Money is not required to buy one necessary of the soul. The man who goes alone can start today; but he who travels with another must wait until the other is ready. A simple and independent mind does not toil at the bidding of any prince. Genius is not a retainer to any emperor. To be a philosopher is not merely to have subtle thoughts; but to so love wisdom as to live according to its dictates. In misfortune, what friend remains a friend? Real friendship is shown in times of trouble; prosperity is full of friends. As for style of writing—if one has anything to say, it drops from him simply and directly, as a stone falls to the ground. Good for the body is the work of the body, good for the soul is the work of the soul, and good for either the work of the other. I felt a positive yearning toward one bush this afternoon. There was a match found for me at last. I fell in love with a shrub oak. It is impossible to give a soldier a good education without making him a deserter. His natural foe is the government that drills him. Authors are a natural and irresistible aristocracy in every society, and, more than kings and emperors, exert an influence on mankind. In the long run men hit only what they aim at. Therefore, though they should fail immediately, they had better aim at something high. A truly good book is something as wildly natural and primitive, mysterious and marvelous, ambrosial and fertile as a fungus or a lichen. We shall see but little way if we require to understand what we see. How few things can a man measure with the tape of his understanding! The poet is a man who lives at last by watching his moods. An old poet comes at last to watch his moods as narrowly as a cat does a mouse. The birds I heard today, which did not come within the scope of my science, sang as freshly as if it had been the first morning of creation. Most of the luxuries, and many of the so-called comforts, of life are not only not indispensable, but positive hindrances to the elevation of mankind. A lake is the landscape's most beautiful and expressive feature. It is earth's eye; looking into which the beholder measures the depth of his own nature. I love Nature partly because she is not man, but a retreat from him. None of his institutions control or pervade her. There a different kind of right prevails. A man must be out-of-doors enough to get experience of wholesome reality, as a ballast to thought and sentiment. Health requires this relaxation, this aimless life. I frequently tramped eight or ten miles through the deepest snow to keep an appointment with a beech-tree, or a yellow-birch, or an old acquaintance among the pines. Associate reverently and as much as you can with your loftiest thoughts. Each thought that is welcomed and recorded is a nest egg, by the side of which more will be laid. Associate reverently and as much as you can with your loftiest thoughts. Each thought that is welcomed and recorded is a nest egg, by the side of which more will be laid. We worship ... Fashion. She spins and weaves and cuts with full authority. The head monkey at Paris puts on a traveller's cap, and all the monkeys in America do the same. Time is but the stream I go a-fishing in. I drink at it; but while I drink I see the sandy bottom and detect how shallow it is. Its thin current slides away, but eternity remains. Most men are engaged in business the greater part of their lives because the soul abhors a vacuum, and they have not discovered any continuous employment for man's nobler faculties. Our moments of inspiration are not lost though we have no particular poem to show for them; for those experiences have left an indelible impression, and we are ever reminded of them. Methinks that the moment my legs begin to move, my thoughts begin to flow, as if I had given vent to the stream at the lower end and consequently new fountains flowed into it at the upper. The youth gets together his materials to build a bridge to the moon, or perchance, a palace or temple on the earth, and, at length, the middle-aged man concludes to build a woodshed with them. William Jennings Bryan compared the way a convention feels about demonstrations to the feeling of a big man whose wife "was in the habit of beating him. When asked why he permitted it, he replied that it seemed to please her and did not hurt him." . . . I am as desirous of being a good neighbor as I am of being a bad subject.